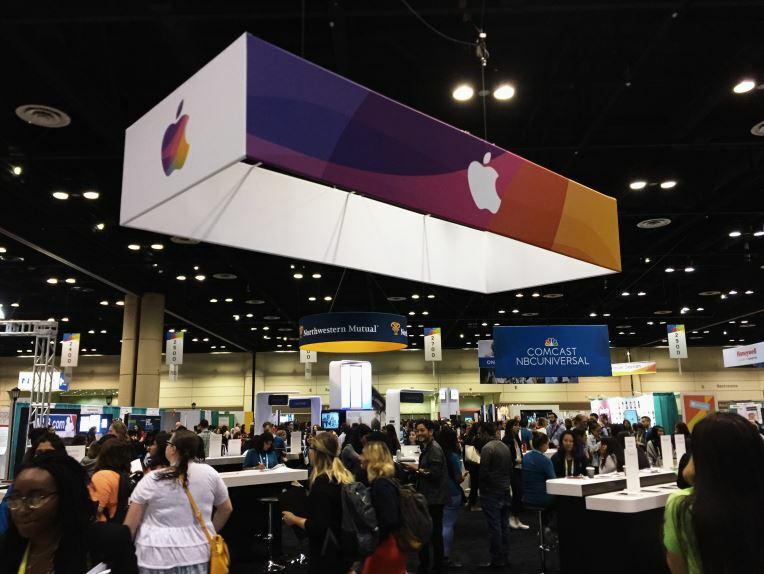 The Grace Hopper Conference (GHC) took place this year from October 4 to October 6 in Orlando, Florida. Did we know what the conference was about? Yes, a celebration of women in computing. Did we know how many people would be attending? Yes, 18,000 women and allies. We knew we would be attending to hear from fantastic speakers, make wonderful new connections with people across North America, and see representation from over 300 corporate and academic sponsors. We were not prepared for the fact that this conference had MUCH more than three days’ worth of material. We shuttled from the hotel to the second-largest convention centre in the United States, the Orange County Convention Center. As the first hour of the celebration approached, the lineup to enter the keynote hall grew behind us; we snatched glances at the lanyards of other attendees, who were representing companies such as Google, Microsoft, and Disney, and academic institutions like MIT, Berkeley, and Waterloo. The keynote hall was enormous. Music was blasting, volunteers enthusiastically showing people to their seats, and we realized that University Square could easily fit in the hall five times over. The speakers began what would be three days of amazing stories by women across technical fields. Dr. Fei-Fei Li, Professor at Stanford, Director of the AI lab, and Chief Scientist at Google Cloud; Debbie Sterling, Founder and CEO of GoldieBlox, who stopped at nothing to see her vision of empowering girls in engineering come true; Dr. Sue Black, Founder of TechMums with an inspiring story of what drove her into technology; and, of course, Melinda Gates, who started out as a Microsoft intern with plenty of failures but now is an icon for women in tech. If anyone was not left in awe after the first day’s keynote series, we can guarantee their jaw dropped once the doors to the Career Expo Hall opened. Companies had gone beyond expectations to make their booths look stunning. 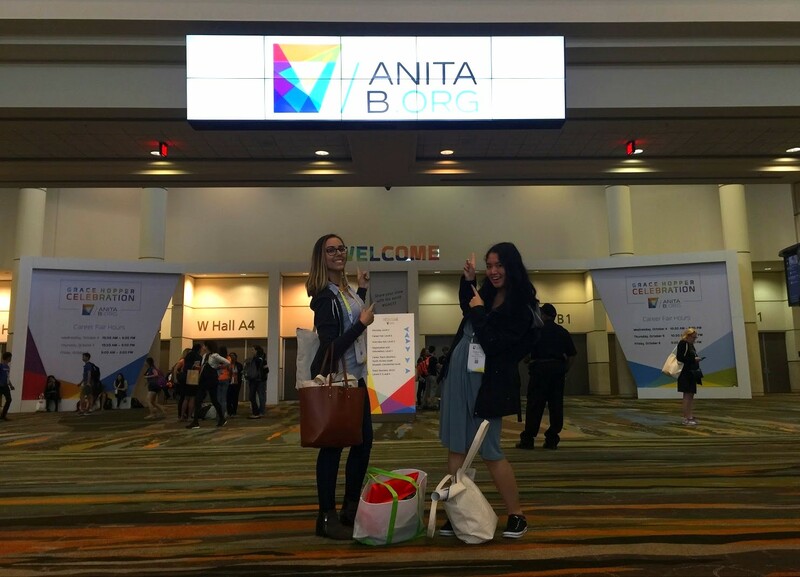 We had never seen so many tech women in one room, which was so refreshing. Students looking for career opportunities could show off their true technical potential without being worried if they were being selected to simply fit a “quota.” It was also great to see companies giving out a mix of “unisex” and women’s-fit clothing amongst their promotional material! Finally, we did not prepare to have some of the best conversations outside the hours of the conference. Every evening, sponsors were hosting events in the halls of nearby hotels, restaurants, and even at DisneyWorld. Although some receptions were by invitation, all the events we wonderfully inclusive, with a mix of casual networking with sponsor representatives, fun music, and delicious catering. This was topped off with an incredible dance party on the final night with our newfound friends. We would like to thank the Faculty again for their generous sponsorship of our attendance. We look forward to sending another delegation next year to grow the female representation of University of Ottawa as more women become involved in this amazing industry! Funding for such student projects and initiatives is now more accessible than ever, thanks to the support of the Centre for Entrepreneurial Engineering Design, the Brunsfield Centre, the Engineering Endowment Fund (EEF) and the Faculty of Engineering. If you would like to take part in conferences related to engineering or computer science, click here.